Arun K. Nair is a young and aspiring author. His debut book – Murderous Greed – is a nice police procedural. Based on this book we can say that he is going to give a healthy competition to Salil Desai. 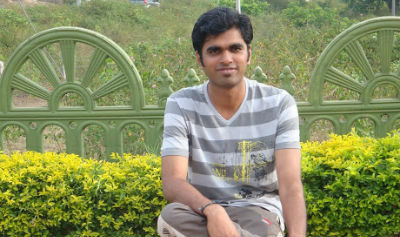 We were curious to have a conversation with Arun, to know more about him and his journey so far. We are fortunate that things worked out and here is the Q/A session with him. I am an engineering graduate from Government College of Technology, Coimbatore with a master’s degree in business management from Great Lakes Institute of Management, Chennai. As life would commonly have it in India, I went on to spend over a decade working for IT Services Companies in different marketing and business development roles, before taking up writing full time. I have a loving wife in Rani Asha, a beloved son in Dharsh and a powerful rock of support in my parents – Kumaran Nair and Sreedevi Amma, and sister Asha. I tried to write a crime novel in 2010, but couldn’t complete it back then due to various reasons. In the last two years, I had been making new friends who are very creative and passionate about movies. We planned to make a short film in 2016; I narrated a few of my stories to them. One of them ended up as a three-minute short film. That was the moment that reignited the spark to write the novel that I never did in 2010! Writing a police procedural is not an easy thing. Also, to add thrills, you need to have more knowledge of forensics, policemen’s routine, etc. Please tell us about your research work in this arena. “Murderous Greed” required some amount of research on police investigation procedures, guns, and bike stunts. I met people, mostly friends, from these walks of life to build more authenticity to the overall story. My next book, which is yet to be titled, deals with forensic investigation. I am currently talking to people working with the forensic department. Usually, authors take various attributes form (more than) one real people and create fictional characters. Can you tell us how you build characters, or who inspired you to certain characters in Murderous Greed? All the characters that you see in the book are people that you will come across in your day-to-day lives, but no one in particular from my life. I only ensured that I kept it real with no unnecessary frills or heroism added for spice. If you look at Inspector Satyajit, a central character in the book, he wakes up in the morning and watches “horoscope of the day program” on TV. There is nothing superficial about any other character. Their days are also just like most of ours. The characters in the book, however, would possess one of the following five traits as a predominant attribute: “jealous” greed, “obvious” greed, “illegal” greed, “vengeful” greed and finally, “good” greed. How have you conceived the idea of – Murderous Greed – your debut novel? Initially, it was a five-line murder story thread that was knit into a book. I discussed with many friends, to slowly weave it into a long story. I was able to complete the whole process in four months. I was very happy with the turn-around time. I used to get stuck at times. This keeps happening even now, as I write my second book. While creative juices flow, I do not like defying logic and hence, I get stuck at particular sections of the story for valid reasoning. I do not write any chapter unless I am personally convinced about my line of thought. I published my book through Notion Press, a very reputed self-publishing firm. Honestly, I did not try the traditional route since I was excited to publish my book and Notion Press offered the fastest route. The story is a thriller revolving around a highway murder. I felt that the red color slays it, says it and plays it so vividly that the plot is aptly conveyed through the cover. Yes, we spent a reasonable amount of time on this. Notion press helped me with multiple versions, and we jointly brainstormed ideas. Why should one read, Murderous Greed, according to you? “Murderous Greed” can be read in four to six hours. If someone is looking at reading a novel with multiple twists in the plot, they should grab a copy. Most people who have messaged me after reading the book completed it in two or three sittings, which is an excellent reward for a writer. Can’t ask for more, can I? The small clues I placed throughout the story were exciting for me personally. Finally, when I tied them all together, I was so happy with the whole exercise. It was a very satisfying feeling. Of course, you cannot spill beans but, can you tell a little about the next book in the series? I am currently working on two books. One is a sequel to Murderous Greed, “Greed Ends“. I am about to complete my second book which deals with a serial killer and prostitution in India. It will capture the journey of a small town girl from a remote village to various cities across India. That is all I can say for now. If this book (as it has potential) has to be adapted as a TV Series (or a movie), whom would you like to play the main characters? I am not sure about it yet, but I would certainly love for it to be adapted into a screenplay. I hope production houses are hearing this or reading my novel. Fingers crossed! To write more! I think Murderous Greed was just my first step. I have goals. I have a long way to go before I can be the author I wish to be. With the support of my family and friends who have motivated me to write, I am confident of coming up with exciting and meaningful stories in my upcoming novels. I am more of an impulsive writer. I write in my diary and at times, on my laptop. I could be at home, in a garden or by the roadside sipping a cup of tea. I write whenever inspiration strikes me, irrespective of where I am. I like to read crime novels and management books. I love to read books by John Grisham and Dan Brown. I also read books by Ashwin Sanghi, Ravi Subramanian, Salil Desai, and Vish Dhamija. They are currently the face of thriller genre in India, and they have all written good novels. I am reading Origin, by Dan Brown. How have people around you, both living and dead, inspired you? I started an online test preparation portal – UrFaculty.com to help students preparing for college entrance exams. I play sports, I jog, and I enjoy traveling, as well. My favorite pastime includes playing volleyball and cricket. What are your favorite travel destinations in India and Abroad? I love Yercaud / Kodaikanal in Tamil Nadu where I have traveled many times. I was lucky enough to visit Kulu, Manali and Rohtang Pass. I am planning to travel to Ladakh next year. We have reached a stage where balancing science and nature has become very difficult. Clean water is my biggest concern. A simple example is how Coovum river, which was once a beautiful river and a water lifeline for Chennai, has been converted into an open sewage and an industrial dumping waterway. Managing industry and household waste is costly. We all should understand that while there is a cost associated with efficiently managing waste, we should actively contribute towards it. If we don’t do this, we will lose most of our water bodies soon enough, and pollution will consume us eventually. Who is your favorite sportsman and why? Vijender Singh, Virat Kohli, Sachin Tendulkar, Mahendra Singh Dhoni and Roger Federer. I like them for their fighting spirit. It has become the most influential medium to spread messages today. As long as it is in the right hands, it can be one of the best tools to spread a positive vibe across the world and solve many global issues. The world is big enough to have space for everything. Some like to read using eBook apps or devices. If it’s a device that is not going to affect their eyes, it’s fine. Phones are useful if you are reading a small blog. For a book, I think, the paperback is still the most satisfying way. Maybe I am still old school when it comes to reading. The definition of moral and ethics has changed with time. For the new-gen kids, we have to reinvent characters and present these stories with a flavor of technology to make it relevant to them. The attention span of kids has also changed with the many distractions our world offers them now. The kids of today are the immediate future for humanity. We have to put an effort to churn those lovely stories that our grandparents narrated to us into exciting new space age avatars.